When buying a new piece, a common question asked by customers is ,”How do I clean it?” We know a lot of the products, especially glass, are very fragile or some times complicated to clean. Not only that, there are different materials that each piece is made of that may alter how it is cleaned. No need to worry! We have plenty of products to help you get the job done. If you have an acrylic piece, such as a steam roller or a water pipe, we recommend the 420 Formula for Acrylic. This formula is made specifically to clean plastics without damaging them or breaking down the acrylic. Simply add the cleaner to the water pipe, or let it soak in a bag or container. We suggest letting it soak longer if the piece is incredibly dirty. 420 Formula cleaner has small salt pieces that help clean your piece as well. Sometimes shaking your piece while it is soaking is an efficient way to get all the residue off. Once it is clean, it should be rinsed thoroughly with water. 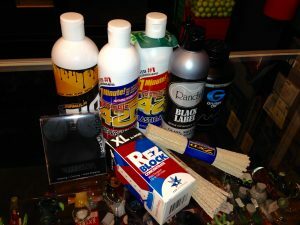 420 Formula also makes a glass cleaner that can be used the same way as the acrylic version, but this formula is slightly more intense to clean glass, metal, or ceramic pieces. Although 420 Formula is a “5 minute cleaner”, we recommend soaking longer if necessary. If your water pipe or bubbler has smaller holes or percolators, the 420 cleaner may not be the cleaner. Instead, try Grunge Off. Grunge Off is a slightly more expensive cleaner, however we promise it is totally worth it. Not only is this cleaner reusable, it will leave your piece looking sparkling new. Grunge Off does not contain any sort of salt material, so this is much more practical for percolator sections or pieces with smaller openings. Simply add the cleaner to your water pipe or pipe and let it soak for an hour or more. For dirtier pieces, we recommend that it soaks over night. Once the piece is clean, rinse the pipe thoroughly. Once you are done cleaning, you can add the used solution back to the bottle. Some people prefer filtering out some of the dirt material before adding back to the bottle, but that is completely up to you. Grunge Off will still work either way. New to the store is a product by 420 Science called RezBlock. This is an all natural, vegan extract that is added to the water of a water pipe before using it. This extract will turn the water pink, however it is completely safe to smoke through. By adding RezBlock to any water pipe water, it will collect the residue instead of allowing it to stick to the sides of the piece. After about a week, or once the water starts to look foggy, rinse the pipe and change the water. Keeping RezBlock in the water pipe water will lessen the amount of times that the piece needs to be cleaned. Another new product in store are the Resolution silicone caps. These are stretchy, different sized silicone caps that fit over all of the openings of a water pipe. The purpose of the Resolution Caps are to allow you to fill your water pipe with cleaner and then shake it to clean the tube. It is also safe to let cleaner sit in the tube with the caps on. The caps will keep all smell and any cleaner inside the tube. Once the piece is clean, rinse the Resolution Caps and save for the next cleaning session. Lastly, we have some miscellaneous cleaning supplies to help you get those hard to reach places. Pipe cleaners are fantastic for pipes, chillums, and sliders. These bad boys come in soft or bristled style to fit your cleaning needs. Soft pipe cleaners would be best for a portable vaporizer or a more fragile glass piece. Bristle pipe cleaners work best for getting the gunk off, especially if its really caked on. For super large water pipes, we carry long cleaning brushes. These are wider to fit tubes and beaker bottoms and work great for hookahs as well. Overall, we should be able to get all our pieces nice and clean like new! Whether it is a glass piece, acrylic or metal, large or small, we have all the supplies to get the job done. Get that quick clean with Formula 420, or go for brand new with Grunge Off. Keep the longevity of the clean with RezBlock in your water pipe and pipe cleaners for your pipes! Happy cleaning! Please call the store if you have any other questions or feel free to come in and visit!